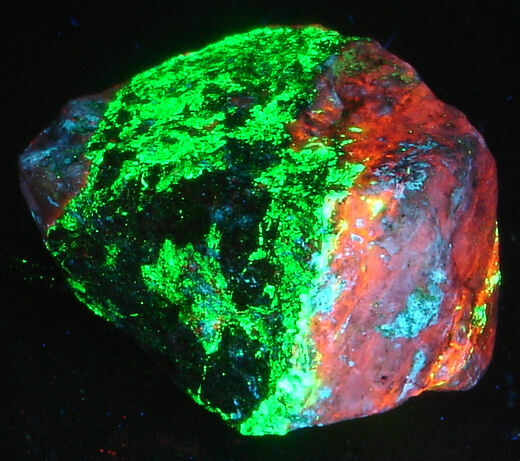 I have hundreds of fluorescent minerals available from famous and rare locations around the world. If you are looking for a particular specimen, E-mail me and I will send you a list of those specimens available and a photo(s). In addition to the single specimens shown here, I will soon be offering beginner boxed mineral collections of Shortwave U.V. 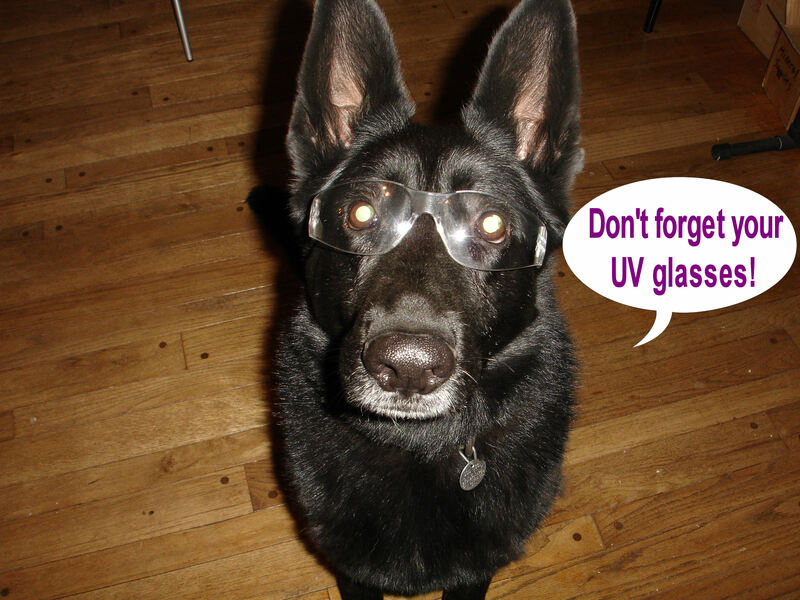 Boxed Longwave UV Collection now available. 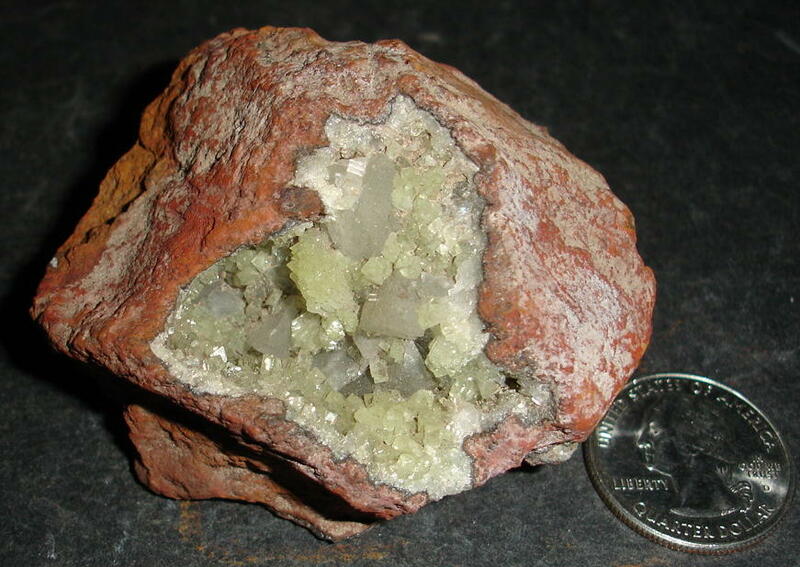 See the ROCK COLLECTIONS page. 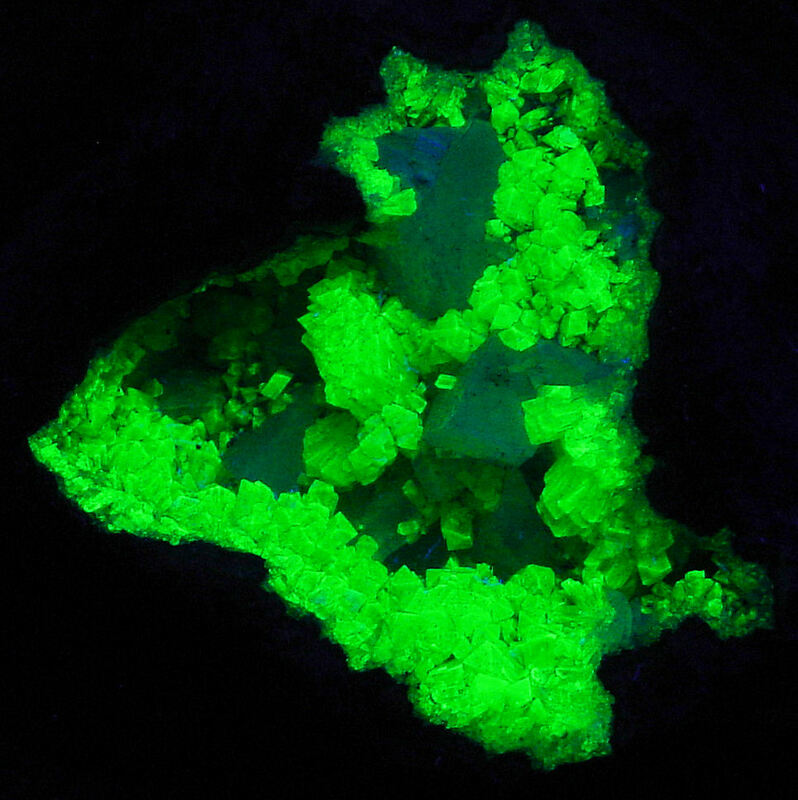 Common abbreviations used when dealing with fluorescent minerals. 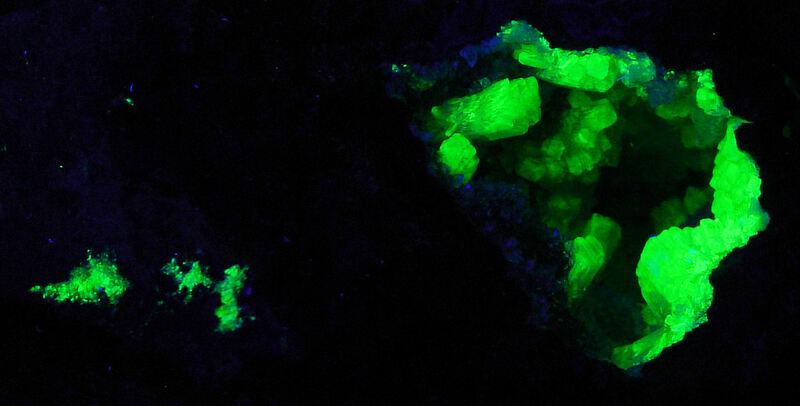 Very collectable fluorescent bright green Adamite crystals and crystal sprays of non fluorescent Calcite in a matrix composed of Limonite. 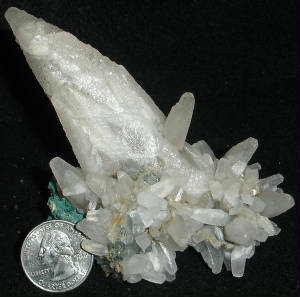 Choice specimen has several vugs filled with crystals. 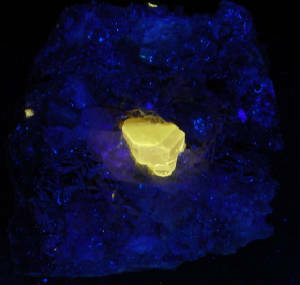 Light greenish-yellow crystals are attractive under natural light and very fluorescent under short wave. From the world famous Mina Ojuela, Mapimi, Durango, Mexico. 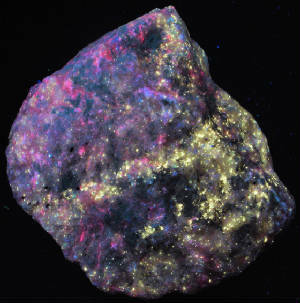 Specimen is 1.5" x 2" x 2.70"
Unusual bright lilac-pink shortwave fluorescence Agrellite and red Eudialyte makes this a real stand out specimen. 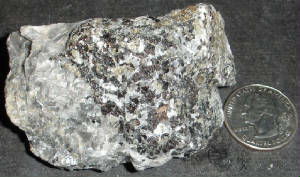 Some minor Thorite is visible. 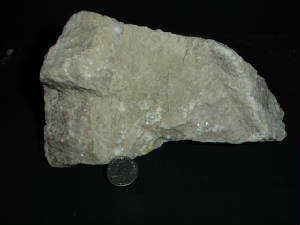 Large cabinet size from the Kipawa River, Villedieu Township, Quebec, Canada. Large cabinet size specimen is 1.50" x 3.25" x 4.50" and weigh's 5.5 oz. During normal mining activity, miners breached a cavern and discovered these wonderful Calcite's growing on the walls and ceiling. Specimens will be available for a limited time as very few were acquired undamaged. 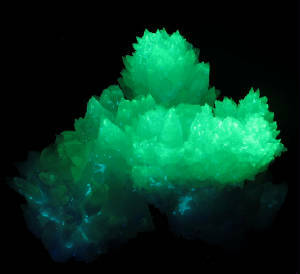 Exquisite Calcite crystal clusters that fluoresces a bright green under short wave. Choice specimen was hand picked from a lot of about 100. 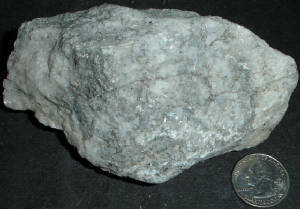 From Mina Potosi, Santa Eulalia District, Chihuahua, Mexico. 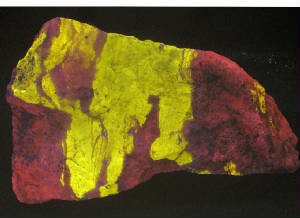 This specimen is a two color piece. 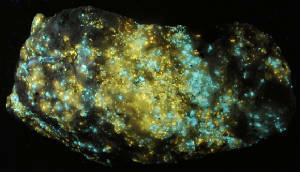 It has an unknown turquoise fluorescent mineral. 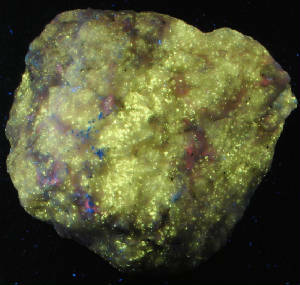 Large Cabinet size specimen is 3" x 3.75" x 4.5"
First picture is under shortwave UV. The second picture is under longwave UV. Outstandingly bright under both Shortwave UV and Longwave UV illumination. 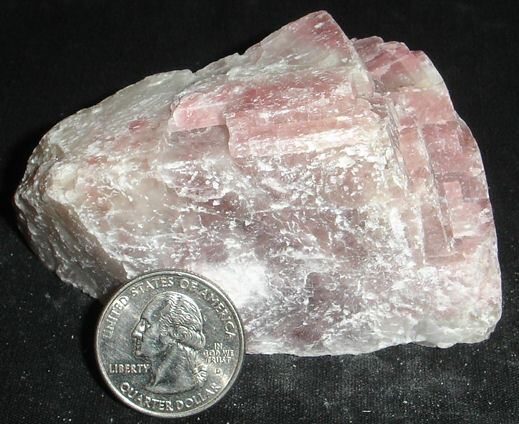 Terlingua CALCITE is a bright pink under longwave and a bright blue under shortwave. 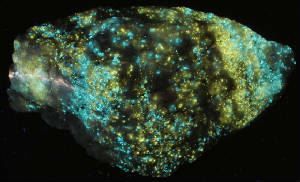 After exposure to shortwave, there is an enduring blue phosphorescence. Every mineral collection should be graced by one (or more) of these exceptional specimens from a mine closed long ago. From Terlingua, Big Bend, Brewster County, Texas. 1.5" x 1.5" x 3.25"
Yellow Humite, red Calcite, pink Aragonite and sky blue Hydrozincite combination. There are also some NF Pyrite crystals in the matrix. Specimen is 1.60" x 1.85" x 2.75"
Red Calcite, pink Aragonite and sky blue Hydrozincite are a choice three color combination. There are also some NF Pyrite crystals in the matrix. 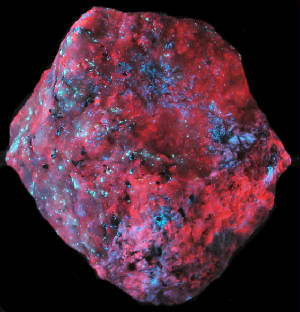 Specimen is 2.25" x 2.75" x 2.75"
Exceptionally bright yellow Humite, red Calcite, pink Aragonite, blue Diopside and sky blue Hydrozincite combination. There are also some NF Pyrite crystals in the matrix. 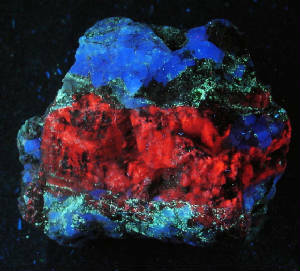 Specimen is 1.50" x 3" x 3"
Yellow Humite, (some) red Calcite, pink Aragonite, blue Diopside and sky blue Hydrozincite combination. There are also some NF Pyrite crystals in the matrix. 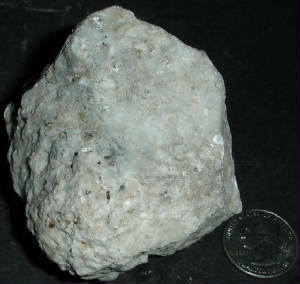 Specimen is 2.25" x 2.85" x 4.5"
The White Knob Quarry is located high up on the north face of the San Bernardino Mountain range, overlooking the Lucerne Valley and the southern end of the Mojave Desert in southern California. 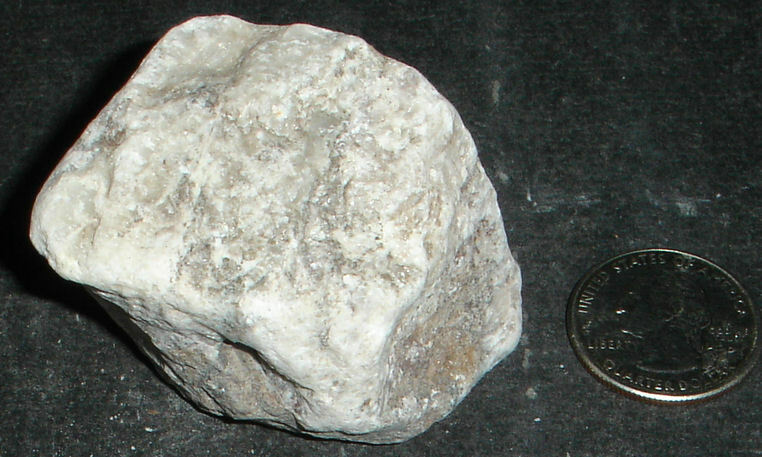 The White Knob Quarry is one of the world’s purest sources of pharmaceutical-grade calcium carbonate. 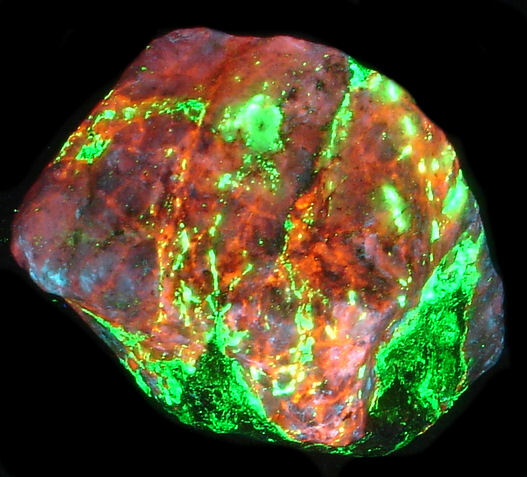 The fluorescent rock is "waste" rock, full of trace minerals giving us wonderful fluorescence! 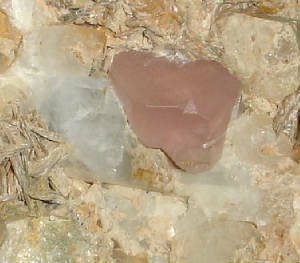 Bright pinkish-red CALCITE, yellow WOLLASTONITE and blue ARAGONITE. 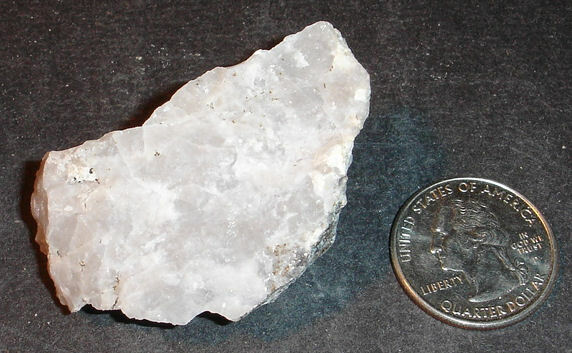 Veins of wollastonite thread thru the calcite matrix. 4.9" x 5.3" x 8" and is 6 lbs 3 oz. OUTSTANDING!! 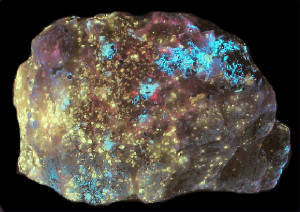 Blend of shortwave fluorescent minerals. 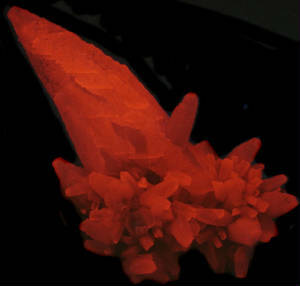 Vivid red Calcite, green and white Willemite (phosphorescent!) deep blue Fluorite and white Aragonite (phosphorescent!) make these top shelf four color specimens! Be sure to add one of these unique specimens to your collection while they are available! Specimens were collected by mineralman during the August 2009 "Big Dig" at the Purple Passion Mine, Wickenburg, Arizona. 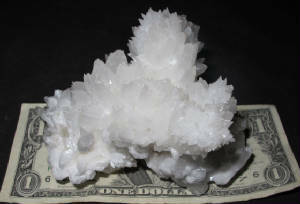 Specimen is a choice (and rare) calcite with bands of fluorite and minor willemite, aragonite. 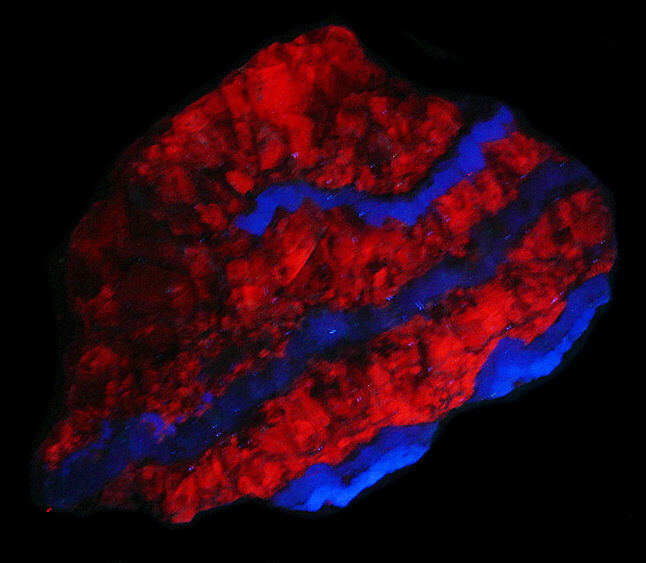 Specimen is 2.5" x 3.5" x 4"
Super bright shortwave fluorescent red/ orange CALCITE, green WILLEMITE and blue -white HYDROZINCITE! Outstanding three color plus rare location makes this a real top shelf keeper! 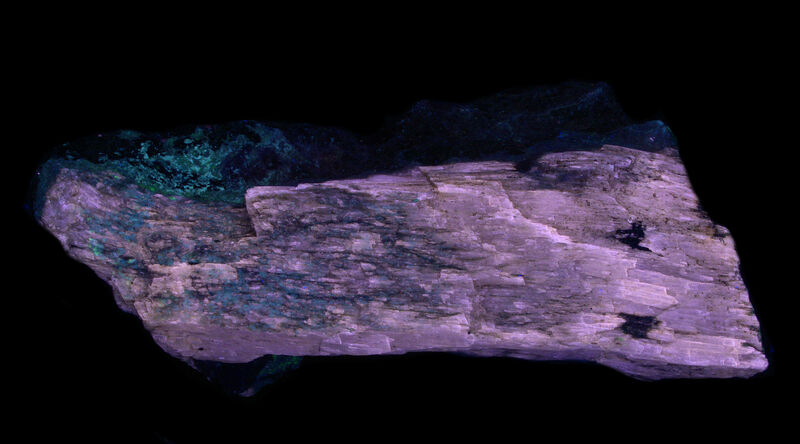 Willemite in this specimen is also PHOSPHORESCENT! 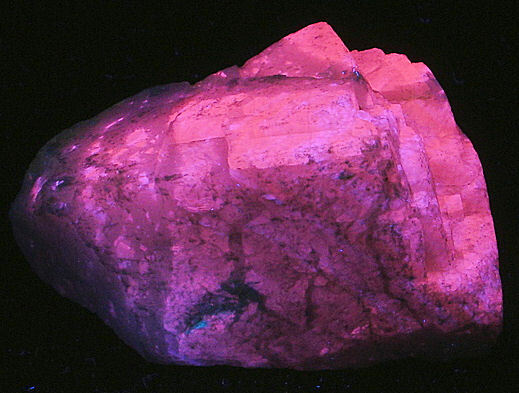 This very rare and extremely remote location is noted as a producer of fluorescent minerals that rival Franklin, New Jersey in brightness and color. 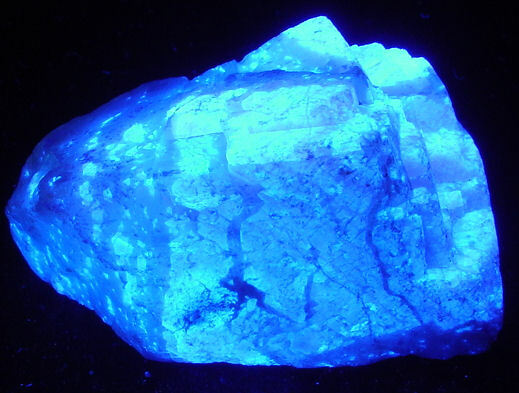 Refer to "FLUORESCENCE Gems and Minerals Under Ultraviolet Light" by Manuel Robbins, pages 17, 204 and 213. This may be the last opportunity to acquire one of these remarkable beauties. The hillside outcrop where these specimens come from is played out and nothing but nonmechanized hand tools are permitted for collecting or traveling to the site. All collecting equipment and specimens have to be carried out in backpacks for several miles over dangerous terrain and steep elevation changes. From Miller Canyon, Huachuca Mountains, Cochise County, Arizona. Specimen is a medium cabinet size. 1.5" x 2" x 2.5" Note coin for size reference. Three vivid colors enhance this outstanding specimen. 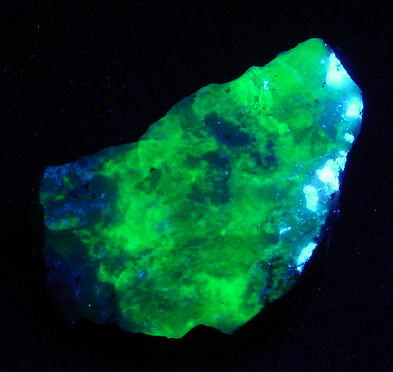 Bright green Hyalite is a beautiful contrast to the white Scheelite and blue Aragonite. 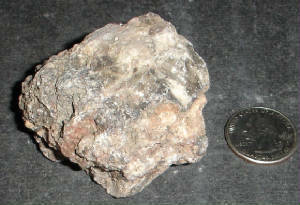 1" x 1 1/2" x 2"
From The Princess Pat Mine, San Bernardino Co., CA. 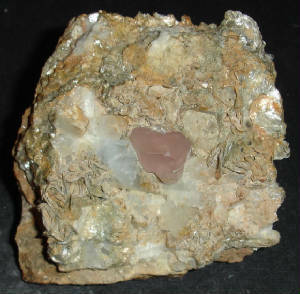 Choice large undamaged FLUORAPATITE crystal nestled next to Aquamarine crystals in a bed of Muscovite matrix. 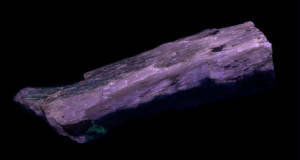 FLUORAPATITE is a bright lemon-yellow under shortwave UV and orange under longwave UV. 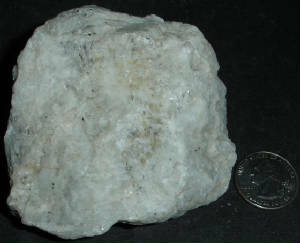 Large cabinet size specimen is 2" x 4" x 4.75". 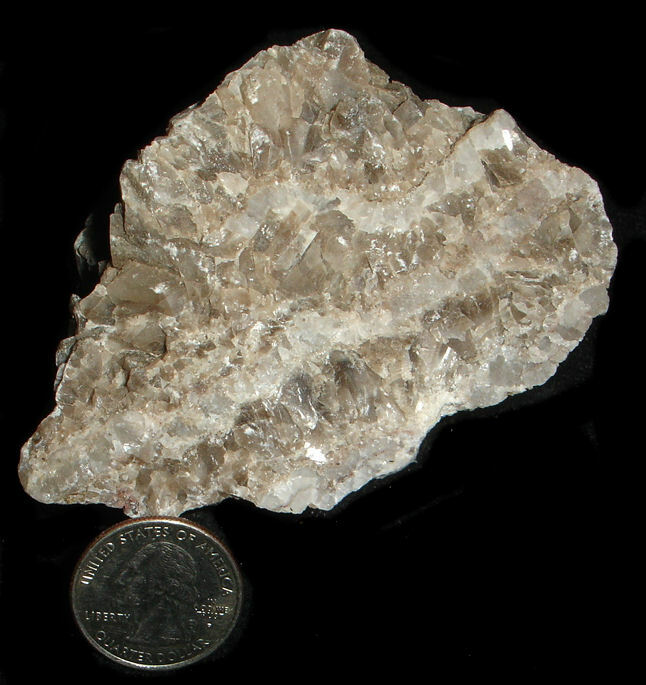 FLUORAPATITE crystal is 3/4". 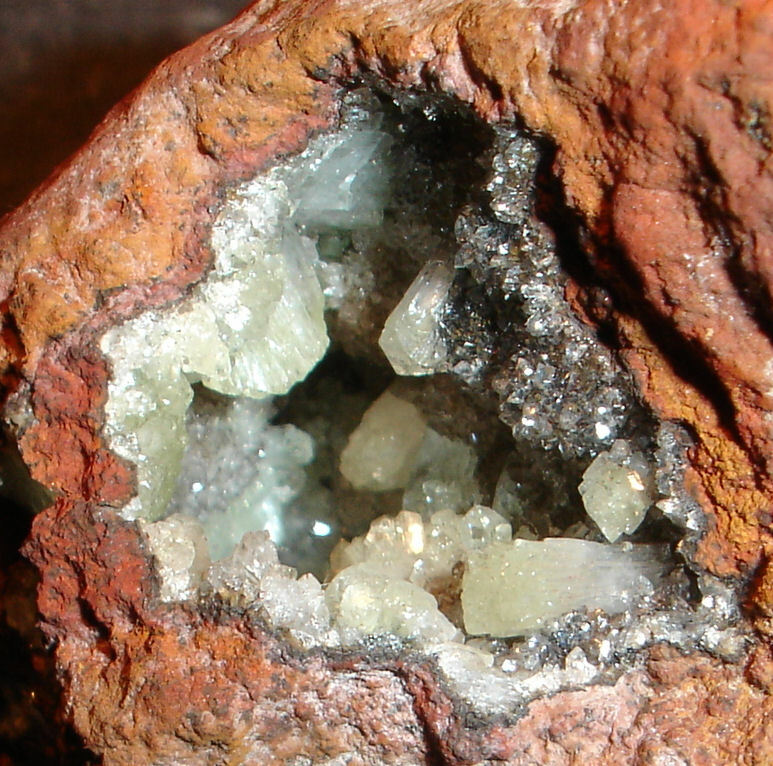 Two smaller FLUORAPATITE crystals adorn this piece. From Shigar Valley, Haramosh mountains, Gilgit, Pakistan.